Turn a cardboard tube into a model of Moses! Then use your finished Moses craft during Sunday School, a Passover celebration, or other religious events to help kids learn the story of Moses. 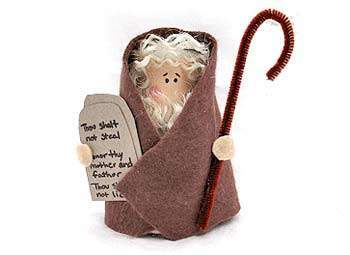 This is a fun crafting activity to teach children about the story of Moses. Paint the cardboard tube using a skin tone of your choice and set it aside to dry. Cut a piece of felt for the cloak. It should be a half-circle slightly bigger than the height of the cardboard tube and able to wrap around it with some overlap. Cut two circles of skin tone felt for Moses’ hands. Cut Moses’ tablet from chipboard. Use the pen to write the first of the Ten Commandments. Bend the pipe cleaner to form a shepherd’s crook. Use pens to add eyes and eyebrows to Moses’ face. Use a pink crayon to add cheeks. Now glue everything together, starting with the hair. Next, glue the beard in place. Wrap the cloak around the tube and glue it closed. Trim any extra felt. Glue the tablet and the crook on either side of Moses. Finally, glue one hand over the edge of the tablet and the other hand over the crook.